And now to catch up with myself. Here is Mistress Winter and Jack Frost. I don't know what's wrong with me lately, but I just haven't managed to get much stitching done. I would have expected to get more done on this one since it was just a couple of colors, but again I had trouble seeing what I was doing since the thread and fabric are almost the same color. I bet it's these new glasses, when I first got them I noticed a lot of blurring when I looked down to do my work. Yes, bifocals here I come! Next is Peacock Garden. I whipped through part 3 in a flash, but part 4 is a killer! I worked on this a few extra days so I could at least finish one quarter. 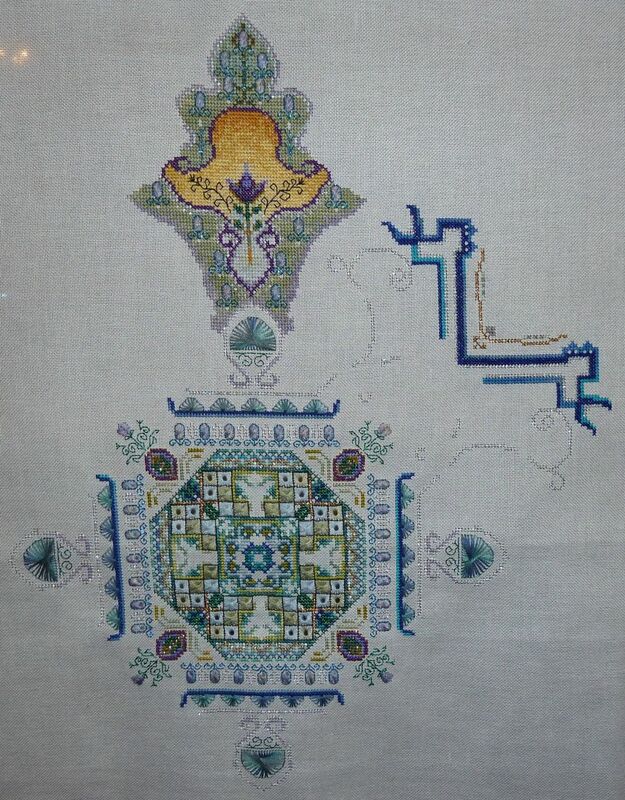 It was somewhat tedious to stitch -- I guess knowing I've got to do it three more times contributes to that! -- but my oh my does it look good when finished! 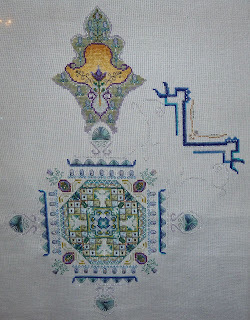 I think the next time I work on this I may skip to the first set of peacocks. And finally, there is Pheonix I. Again, I didn't get as much done as I had hoped. I didn't stitch at all Christmas Day or the day after-- I got the kids a Wii and I let them have the TV. Also, I treated myself to a Kindle which is certainly another reason why I'm not getting as much done. I'm reading quite a bit more and the Scrabble game for the thing is horribly addictive! I'm really glad I finally got one, though. Yes, yet another new start. Here is Florabundance. And a familiar face -- Martyr's -- now complete with both eyes. I'm afraid I wimped out and didn't bother with any of the black. My Dragon Skies dragon is slowly emerging! Lots of fun to stitch! R est and relaxation! It also means I get a chance to get my blog up-to-date. So, on November 1 I started another round of my ever-changing rotation. First in line was And They Sinned. I got a whole bunch done on this one and am now over the half-way mark. It helped that most of it was letters. 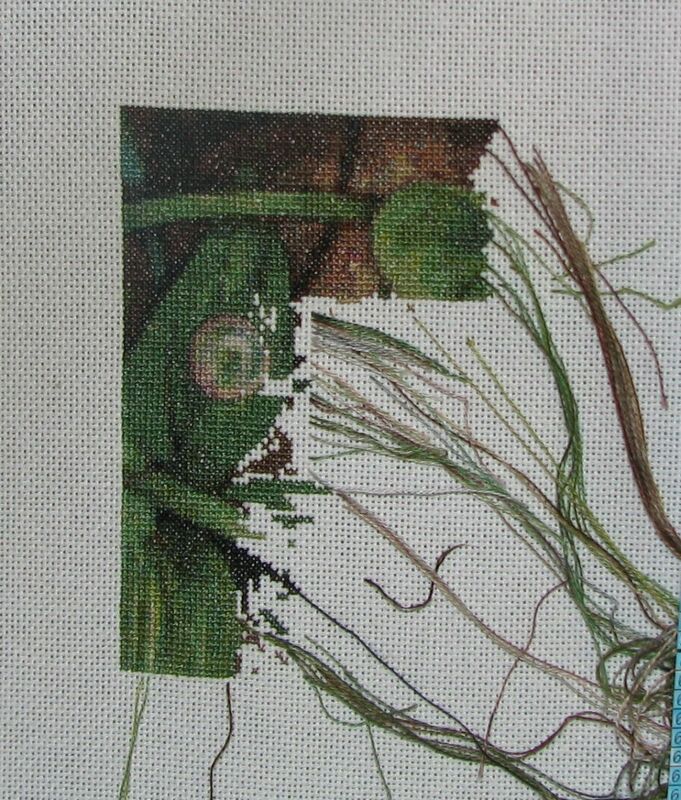 Not exactly the most fun to stitch, but at least it goes quickly! 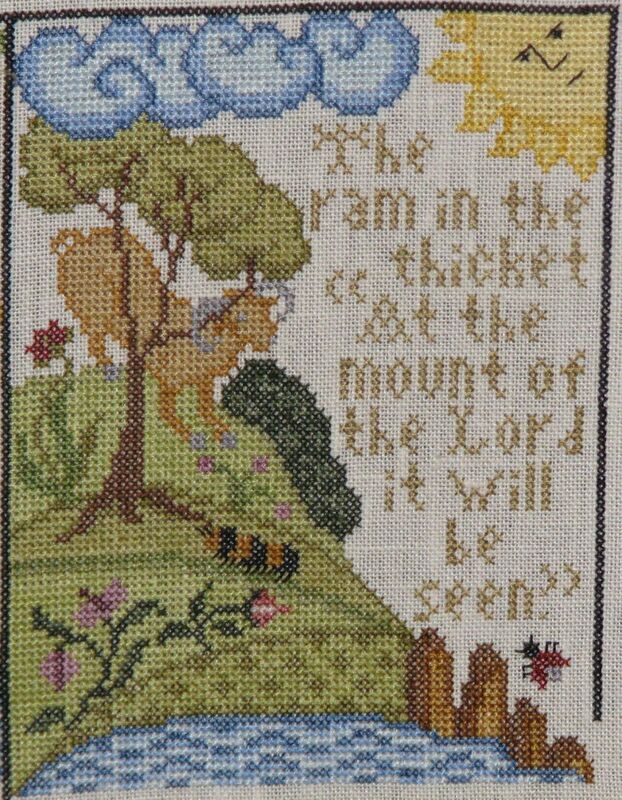 And finally (for this post at least), The Ram block on the Days of Advent Sampler. I really enjoy working on this one! I've given up on Gatekeeper. It makes me sad since this was my first HAED ever and I've started it twice and purchased 3 different fabrics for it. So there's a lot invested in it. But I just can't manage stitching on the dark fabric. Particularly now that my up-close vision no longer matches the prescription for my eye glasses. Next year I plan to make the leap to bifocals and maybe I will give it another try then. I also tried my hand at some ornaments. The stitching part was pretty good. The finishing however... Well, let's just say they came out looking very, very wonky and I think next time I'll go with round ones since the corners were the worst. And my lovely friends who received them as gifts choose to ignore the wonkiness of the finishing and instead focused on the stitching itself. I've been dealing with a bit of a health issue. Apparently when I joked about how I felt like I was bleeding to death when I had my period I wasn't joking. Said bleeding led to extreme anemia. I finally went to the doctor and the problem was discovered. I'm taking iron and "hormone therapy". My period has pretty much stopped and my iron levels are increasing nicely. I'm very thankful it wasn't anything more serious. And my son has returned. I can't say that I'm happy about that. My daughter and I were living a nice, calm life and that has certainly been disrupted. I love my son, but we drive each other nuts so it's much easier loving him at a distance! His intention is to work as much as possible in order to get a car and save some money and then return to NM in the fall. In the meantime, he'll be taking classes at the college where I work.